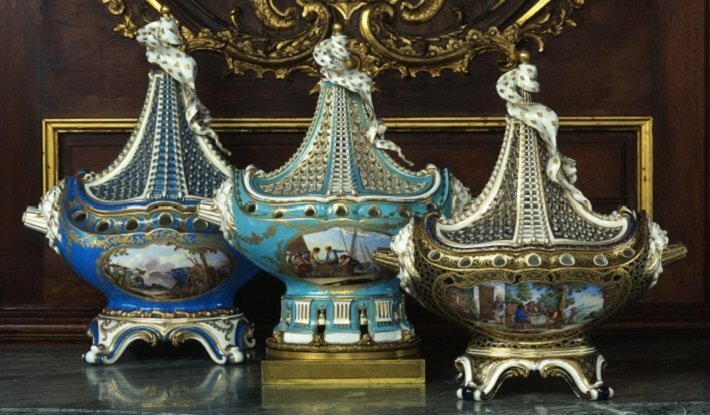 What is the Sevres Porcelain Factory and why is it important? Though a ceramics factory in an unassuming town on the outskirts of Paris may not seem like the most engaging topic ever written about, the tale of the Manufacture Nationale de Sèvres – known more commonly as Sèvres, or simply Sevres – is one of intrigue, espionage, war, revolution, royalty and some of the greatest works of decorative art ever made. The story begins, not in the French town of Sevres, but in the German town of Meissen in 1708. A potter named Ehrenfried Walther von Tschirnhaus had just discovered the secret to making hard-paste porcelain, a type of fine porcelain which no-one outside of China and Japan knew how to make. Known as ‘white gold’ at the time, porcelain was one of the most highly-prized materials in Europe in the 18th Century. Meissen quickly became successful – and rich. Jealous of Meissen’s success, King Louis XV of France set his potters the task of finding out the secret of hard-paste porcelain at all costs – whether that meant copying, spying or stealing. 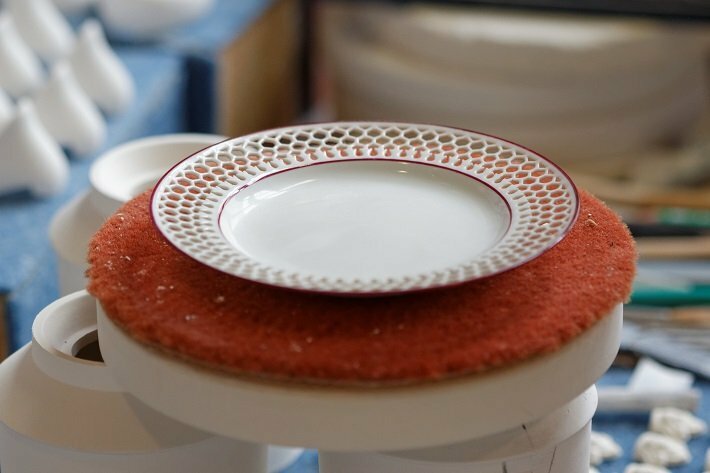 The initial factory was founded in the Parisian suburb of Vincennes and placed under the leadership of French ceramicist Jean-Claude Duplessis. By the 1750s they had even begun employing potters from Meissen itself, including the celebrated ceramicist Jean Hellot. Madame de Pompadour, one of the most important patrons of the arts in 18th Century France (and Louis XV’s mistress), had taken an interest in the factory, after which its production started to flourish. 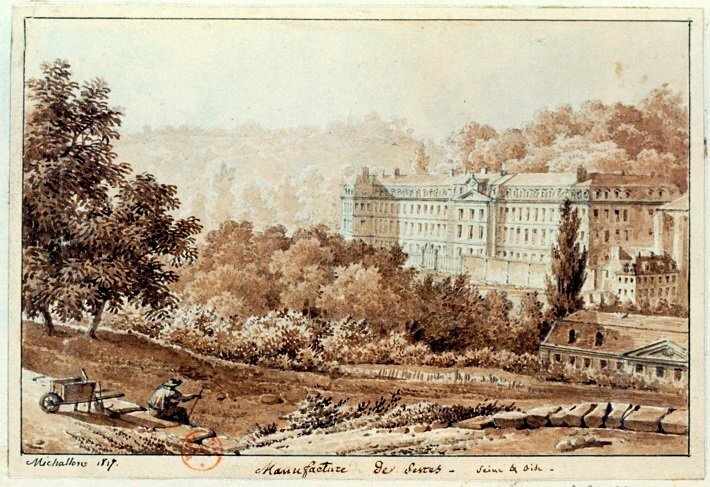 In 1756 she requested that the factory be moved to the town of Sevres, so it could be nearer her chateau. Having started as an attempt merely to imitate Meissen porcelain, by the later 18th Century Sevres had developed its own distinctive style of decoration. And in 1770 they struck gold: they finally discovered the secret to hard-paste porcelain, becoming only the second manufacturer in Europe to do so. Despite nearly falling into financial ruin during the French Revolution of the 1790s, by the start of the 19th Century Sevres had overtaken Meissen to become the most highly regarded porcelain manufacturer in Europe. 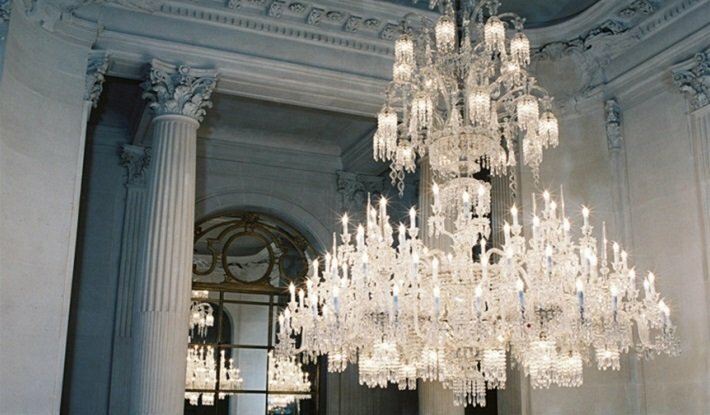 And no matter who has ruled France in the 200 years since, the Sevres factory has always been a prized possession of the French state, remaining in the hands of the government of the day, whether during revolution, war, prosperity or peace. The Manufacture Nationale de Sèvres is, then, more than simply a ceramics factory in an unassuming French town: it is a symbol of the power and prestige of the French state. How is Sevres porcelain made? One of the reasons for the high quality of Sevres porcelain pieces was the discovery, in around 1768, of a deposit of the mineral kaolin near the French town of Limoges. Kaolin was one of the main ingredients of Chinese-style hard-paste porcelain, and replaced the previous glass-based, soft-paste (or pâte tendre in French) kind of porcelain which had been the main product of the factory until that point. Sevres porcelain is made by firing kaolin with the minerals feldspar and quartz at temperatures approaching 1300°C, in large ovens known as kilns. In the late 19th Century, Sevres had six new kilns built, which were some of the most technologically advanced ever seen. More importantly, their large size allowed for the production of monumental porcelain wares, for which the Sevres factory became well-known. The manufacturers produced two different types of porcelain, each using a slightly different technique, in these ovens: biscuit, or rough, unglazed pottery, and glazed porcelain. It was the glazed porcelain vases, dinner services and plaques which were the most celebrated and finest products, not least due to their distinctive blue colour, obtained by adding cobalt oxide to the glaze. So as well as pioneering a new method of making porcelain, Sevres also invented a completely new shade of blue. The distinctive inky, dark blue one finds on many antique Sevres pieces is commonly known as bleu Sèvres, or ‘Sevres blue’. Sevres was also commissioned, in the 1750s, to produce a dinner service for King Louis XV in a lighter shade of blue. This was known as bleu celeste ('heavenly blue’ or simply sky blue), and has become another classic shade associated with the French manufactory's wares. 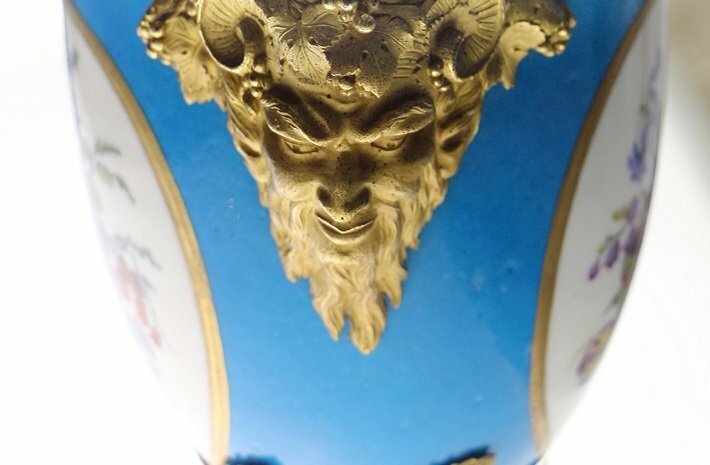 Although blue was the distinctive base colour, or ground, for many of the Sevres products, they were also known for their wide range of coloured decorations. Until 1780, the Sevres manufacturers had the total monopoly in France on painting porcelain in more than one colour. Pinks, greens, gold, white and, of course, blue all featured prominently on Sevres pieces. What does Sevres porcelain look like? As explained above, 18th Century Sevres porcelain (and later Sevres style porcelain) is identifiable by its bright, vivid colour palette, commonly incorporating the distinctive dark 'Sevres blue' colour. Painted scenes, or cartouches, also feature on Sevres vases and dinner services: these frequently consist of court scenes, lanscapes and depictions of mythology. Military and maritime scenes, hunting, and birds were other subjects that were regularly used as decorative features by Sevres. The Sevres manufacturers also pioneered several innovations in porcelain making, including ‘reticulated’ or pierced porcelain, and the technique of ‘pâte-sur-pâte’, whereby a translucent relief design is applied to the object's surface. Both techniques introduced texture into porcelain decoration and further enhanced Sevres' reputation for quality and refinement. Outside of this, there are few distinctive features which are recognisably ‘Sevres’, as the factory continually adapted its production to the prevailing design orthodoxy of the day. So for Sevres, the 18th Century was the age of Rococo; the turn of the 19th Century the age of Neoclassicism; the rest of the 19th Century taken up by experimentation with the neo-Gothic and the Art Nouveau; and the 20th Century the age of Modernism. Each era and style had its own distinct look. What are the most famous pieces ever produced by Sevres? As the factory of the French state, Sevres were regularly called upon during the 18th and 19th Centuries to produce diplomatic gifts. It was as a consequence of this role that Sevres produced some of its most famous porcelain dinner services, vases and plaques. 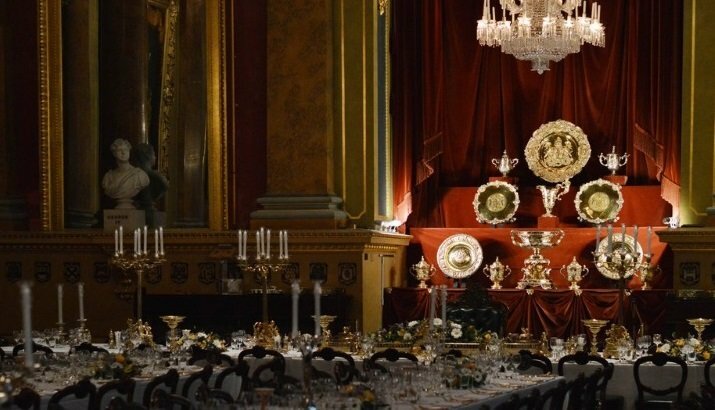 Perhaps the most notorious porcelain dinner service produced by Sevres was the 700 piece service commissioned in the 1770s by Catherine the Great of Russia, which she gave as a gift to her secret lover, Prince Grigory Potemkin. 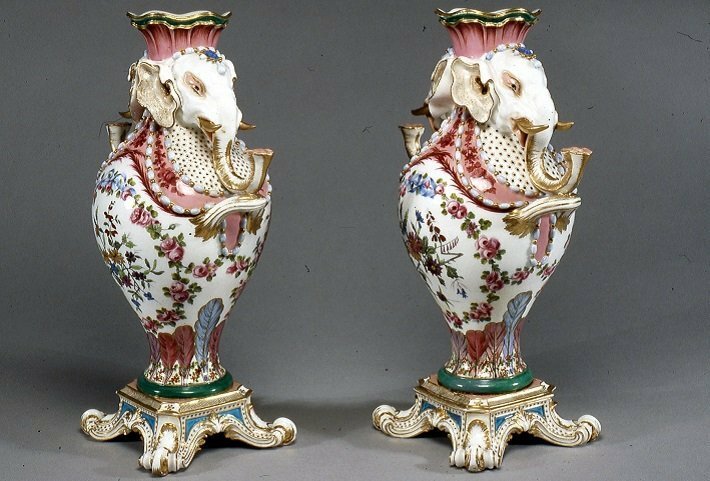 Some of the most well known porcelain vases produced by Sevres include their ‘elephant head’ vases, which were popular with King Louis XV and Madame de Pompadour. Also of note are the King's pot-pourri vases, designed and crated by Sevres as ships (see main image) to commemorate France’s victory in a naval battle during the Seven Years’ War. The early 19th Century 'Clodion' vases were some of the most important pieces produced by Sevres during the Restauration period (1814-1830). Designed by the skilled painter and drawer Jean-Charles-Francois Leloy, the vases feature depictions of exotic African wildlife, set on a beautiful imitation tortoiseshell ground. They were given as a gift by the newly-crowned King Louis XVIII to his brother, the future King Charles X.
Sevres also worked with many of the most famous ebenistes (furniture-makers) of the time, including Martin Carlin (French, 1730-1785), whose pieces were famous for incorporating Sevres plaques into their design, as shown below. Which artists are associated with Sevres? Many of Sevres’ important works were designed, sculpted and painted by some of the most important artists and designers in European history. In the 18th Century, for example, court painter and a favourite artist of Madame de Pompadour, Francois Boucher, created several pieces for Sevres. In fact, many of Sevres’ early porcelain figures were based on scenes from Boucher's paintings. Another important artistic director of Sevres was the 19th Century sculptor Albert-Ernest Carrier-Belleuse. He was known for moving the factory forward into the modern era, by employing, among others, Auguste Rodin as a junior modeller and decorator. Rodin would go on to become regarded as one of the most important sculptors in Western art history. 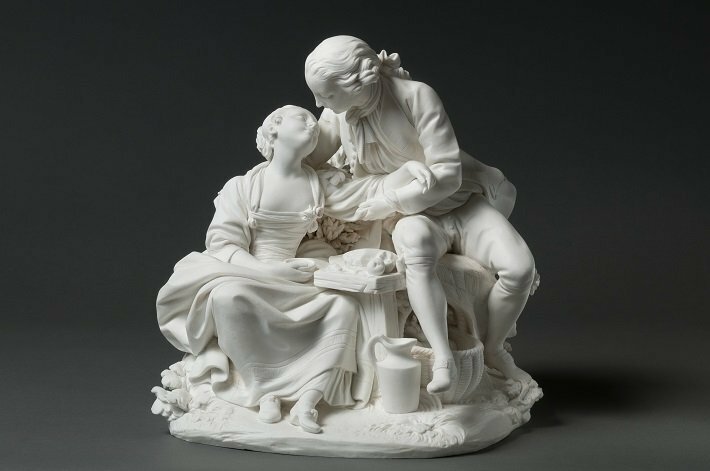 Such was the prestige of the Sevres factory that, as a young French sculptor in the 18th and 19th Centuries, working as a modeller for Sevres was a sure way of gaining recognition and building one's reputation as an artist. Into the 20th Century, important sculptors and artists from around the world, including Viola Frey, Roberto Matta, and Jean Arp all worked for, or with, Sevres at some stage in their career. 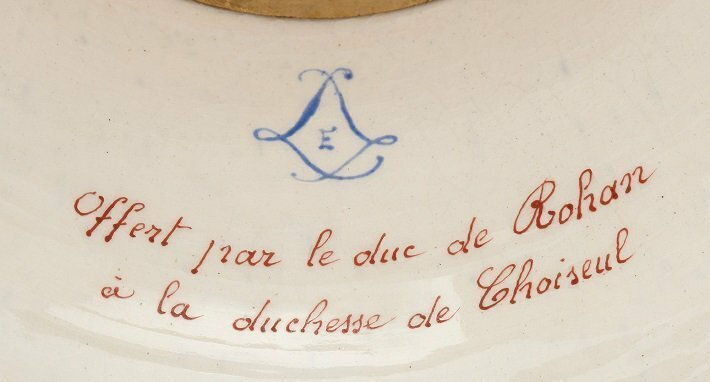 All porcelain produced by the Sevres factory is stamped, normally on the underside of the piece, with its signature blue mark. The mark shows two Ls ‘interlaced’ with each other, normally with a letter inside. The letter on the inside of the double-L mark is there to show the year in which the piece was made. 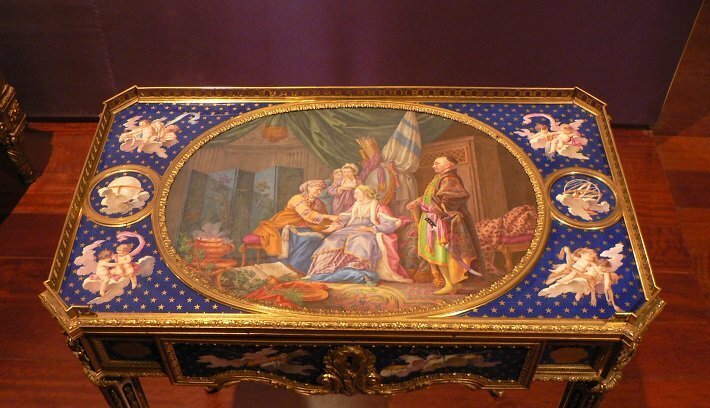 In addition to the Sevres marks, many Sevres pieces would feature the signature of the painter or decorator. This was particularly the case for their porcelain vases. Unfortunately, these marks are hardly reliable as guides to whether a piece was really made by Sevres. In the early 19th Century, such was the popularity and status of Sevres porcelain that many European factories set up business trying to emulate Sevres pieces, even marking them with the double-L mark. 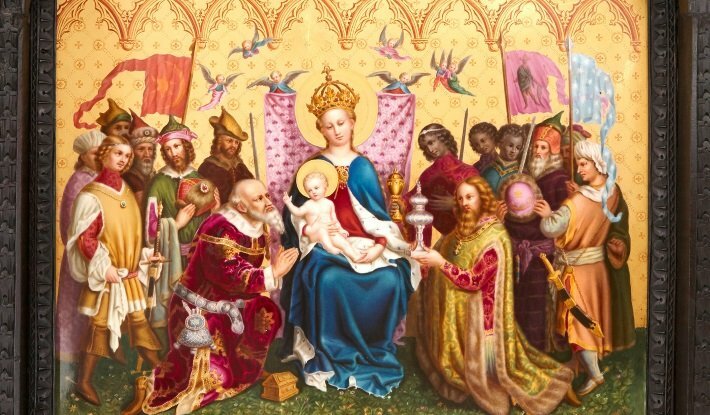 Some of these copies were cheap fakes – and there were obvious giveaways, from the quality of the painting and gilding, to the evenness of the glaze. But some of these pieces were just as good – occasionally even better – than the ‘real’ thing. Indeed, many pieces today not made by Sevres are nevertheless described as 'Sevres porcelain'. In fact, these pieces are better described as 'Sevres style' porcelain pieces. 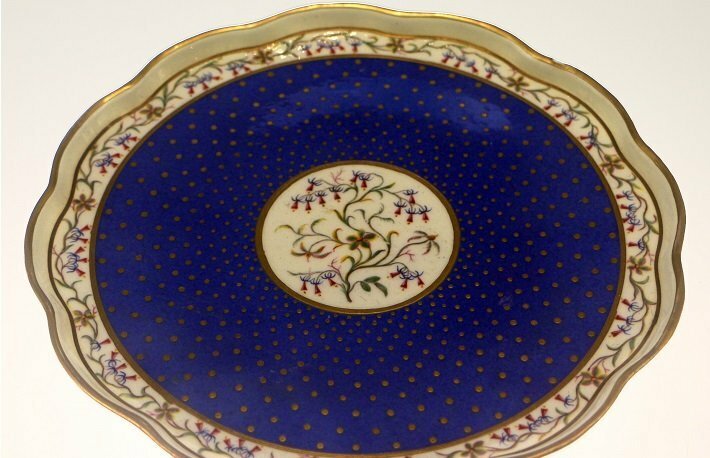 Because so many wares were produced both by the Sevres factory and in the Sevres style over the course of the 19th Century, it became extremely difficult in many cases to tell what is Sevres, anad what is Sevres style. But in a sense, it didn’t matter whether something was made by Sevres or in the Sevres style - what mattered to buyers and collectors then, as to buyers and collectors now, was the quality of the piece. Is Sevres porcelain still made? The Manufacture Nationale de Sevres continues to produce porcelain dinner services, vases, painted plaques and figures into 21st Century, still using the same techniques they pioneered during the 18th and 19th Centuries. There is now a museum dedicated to the work of Sevres on the site of the factory, as well as another smaller museum in central Paris. In addition, several public collections are particularly renowned for owning large amounts of antique Sevres pieces. These include the Rothschild collection at Waddesdon Manor in Buckinghamshire, England, and the Wallace Collection in London. And Sevres pieces can be found in some of the most-visited and largest museums of art in Europe: the Louvre, the Victoria and Albert Museum, the Metropolitan Museum of Art, and the Hermitage Gallery. Sevres porcelain and Sevres style porcelain pieces are to this day some of the most high quality works of porcelain art ever produced. It’s perhaps not surprising, then, that Sevres is such an integral part of the landscape of decorative arts today. The Sevres factory is not only famous for producing beautiful porcelain wares: it also brought down a world Empire. In 1919, the Treaty of Sevres - which split up the Ottoman Empire following its defeat in the First World War - was signed in the exhibition room at the factory.